We arrived at the New Theatre in good time and sat in our seats, situated in the stalls. We were so pleased with our view, especially with two small children in tow. Not long after getting cosy another family told us we were in their seats. True to their word and to our annoyance we had to move as we realised our seats were situated in the circle. As we hastily got to our seats and got cosy for the 2nd time the seats were actually better that we thought. The view in the circle was particularly good so we ended up being extremely happy after all. The show commenced with the very beautiful Linda Lusadi appearing as the Fairy God Mother. She gets better looking as she gets older and although her part had a serious role she also came out with some very funny lines and she also held a note really well too. The character Buttons then appeared and captivated the audience’s heart for his love for Cinderella. Secretly, I was hoping for a twist as all sorts of surprising things happened in this Panto. He was extremely entertaining and at some points during the show he had you wondering if something had gone wrong during the scene because he was struggling to keep a straight face. We were also glad we moved from the stalls because Buttons decided to spray the audience several times with water. There is one part which I will not give away but the entire audience were laughing hysterically with a funny song from Buttons, The Fairy Godmother, The Prince and Dandini. The Ugly Sisters, played by Mike Doyle and Sam Cane, were absolutely hilarious. If I was having a night out I would want them as part of my gang. The innuendos, the songs, the faces they pulled, the jokes, had us in fits of laughter. The Prince (Lee Mead) played the true gentleman and reminded me of a younger version of Hugh Grant in this role. He looked so charming the role fitted him perfectly and his voice was amazing too. 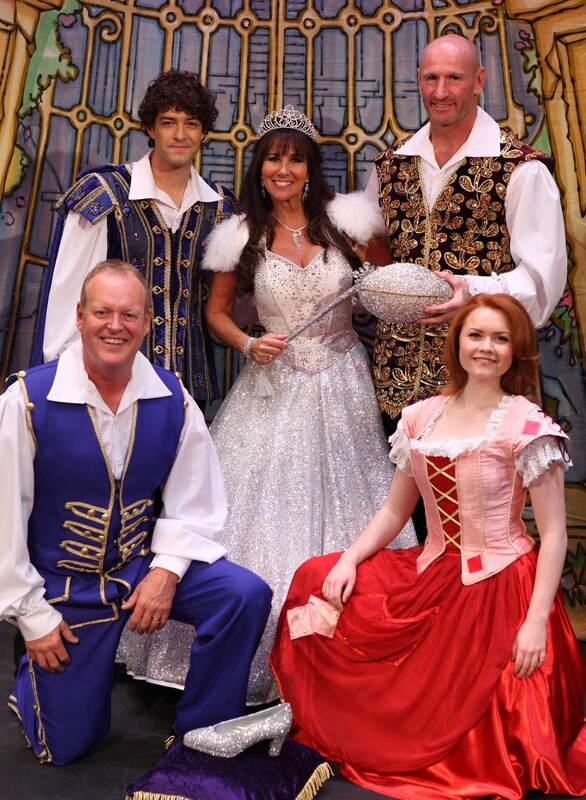 Dandini was played by Welsh rugby legend Gareth Thomas, and the audience erupted into cheers when he came on stage. He is so loved by his home crowd. He came across so relaxed, and a true natural on stage. There was one part that was definitely made for the adults when the ugly sisters tore parts of his clothing off. Very very funny and done in such a way our children found it hilarious too. Cinderella was truly wonderful. Her voice was beautiful and being a Cardiff girl she made her home town very proud. You really won’t be disappointed seeing this panto version of Cinderella. It has something for everyone, both young and old alike, with many jokes being strictly for the adults, while there’s more than enough slapstick comedy to keep the younger audience members entertained. A must see!